At the beginning of February is the annual Futsal Jamboree. Futsal is 5 on 5, small field soccer. All elementary grades are represented, plus at lunchtime the local jr. high boys take on the fathers. Like all sports around here, it’s very well organized. And they serve a great lunch! 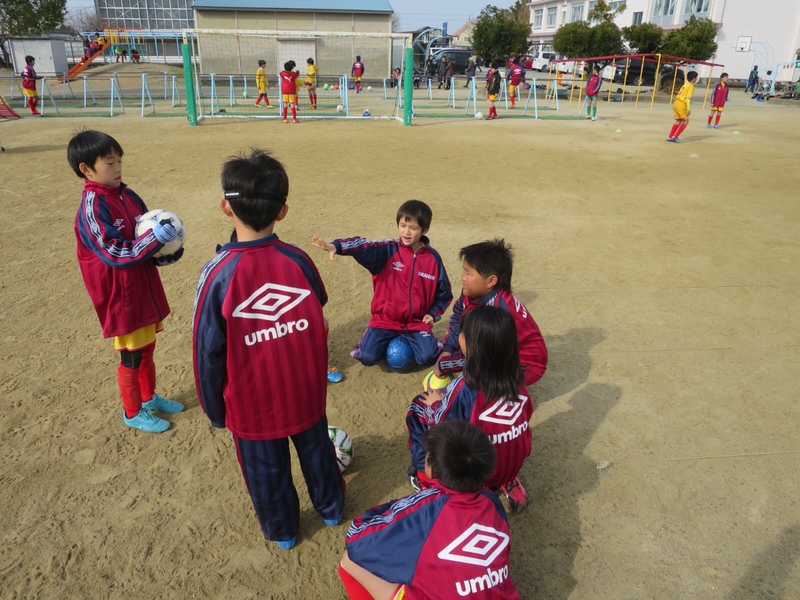 Saturday is a work-day for many fathers, and the 4th-grade Nakagori squad was without a coach. I rounded up the lads and gave them a pep-talk before game one. Each grade had four or five teams, and the tournament was set up as a three game round robin- the team with the most points wins. Nakagori did well. I think we had three grades that came out on top. Owen and Allen’s team got second in the 4th grade division. Owen receives a nice looping pass from defender Riku. This short-field game suits fatty Riku well, with his ball control, sharp passes, bullet shots, and of course no need to exhaust oneself running up and down a full-sized field. O and A in second-half action. Owen fakes a long shot, then dribbles to his left to pass the off-balance #7. Fumie and the peanut gallery. Meanwhile, the soba/udon noodle vats are getting fired up. These jokers are pestering the mothers for food already. 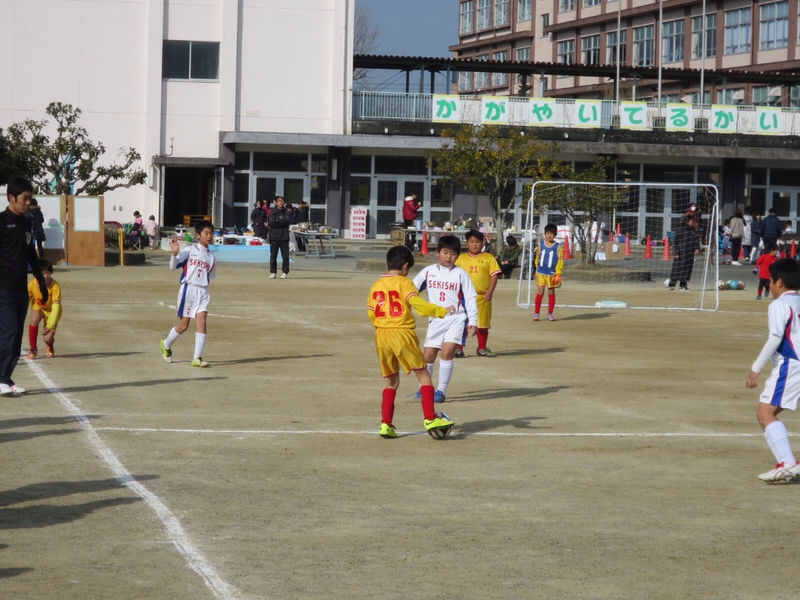 Game two was against Ohse, the other feeder school to Nakagori Jr. High. Ohse was a very weak opponent, but they have one good player, the big Indian kid, #4. Maybe O. and he will play together for the junior high team in a couple years. Note the construction barrier behind the goal- they are building a higher fence behind the playground so balls quit sailing into windows (see the board across the windows on the dark house). I’ve kicked a few over the old fence! Allen had that uh-oh, what did I do look on his face. The boys stopped preening and got back to the game. More results are in and the local moms are feeling proud! Nakagori teams are undefeated, so far! 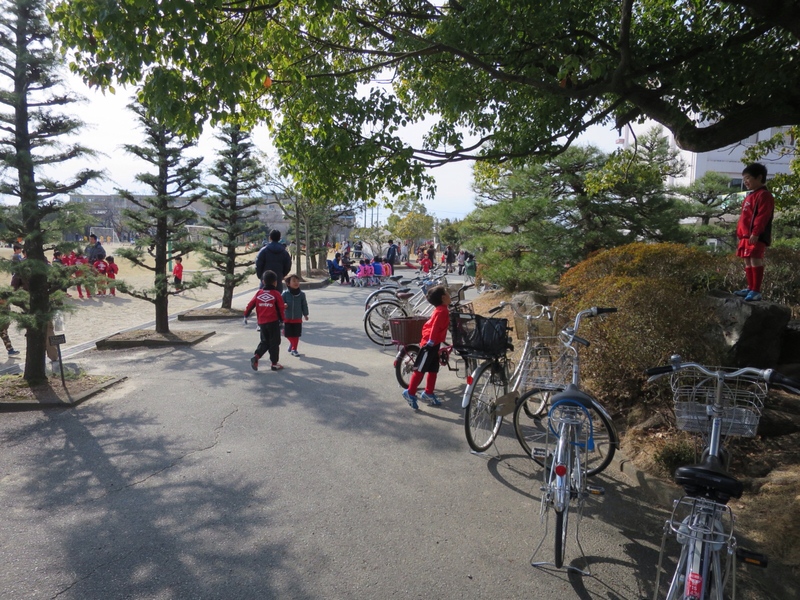 Action on field 1- 2nd graders: Sekishi vs. Ohse. Four stations to bring you a succulent, piping hot bowl of soba or udon. Station 3: fishcakes, shrimp bits, rice crispies, and green onions. Station 4: Serve it up with chopsticks, season to your liking. They also had sweet mochi (gooey rice) in a bean sauce for desert, and the proverbial picnic favorite, salmon onigiri (rice cakes). 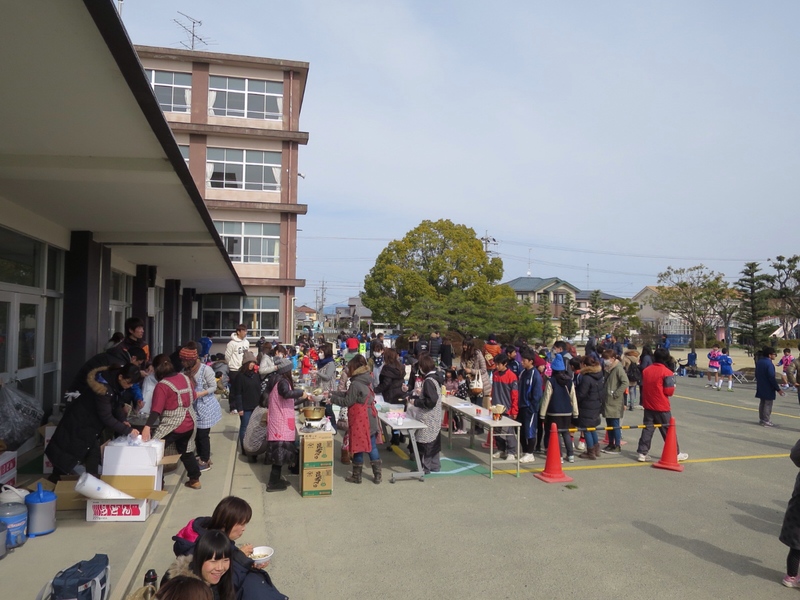 Rice is a staple food in Japan. That’s how I found out that the assistant is a line judge in futsal. I didn’t have my camera for our last game, but it was a barn-burner. Kosai was the opponent and they were tough. They had this little third grade ringer they brought up and he was quick and agile, like a little Messi. Kosai scored two and I motioned for Owen to come closer to the side while they were waiting for a ball to be retrieved. I kid you not, O. netted one thirty seconds after that! I turned to Fumie and tried to take credit for the goal but she brushed me off and cheered for her son and the team. Owen fought like a trooper and scored the equalizer about a minute before the half. Unfortunately, little Messi answered with a clean shot on a breakaway just seconds later, and we were down 3-2 at the half. The second half started grim- we were against a wind whipping and gaining in strength and Kosai opened the scoring with blast from their biggest kid. After a hard-fought five minutes or so, Owen netted another for the hat trick! I must, in fairness mention that the Kosai coach had subbed-in his second string in the first half at 2-0 and again in the second half at 4-2, so Owen was facing a much weaker defense for his barrage of goals. At 4-3, Kosai stopped mucking around and put Messi and the big kid back in. We fought hard against a tough opponent and a tough wind, but Kosai held on for the win. Oh, well, after those Cam Newtonesque gyrations in the 2nd game, I think it was time for a nice slice of humble pie for Nakagori anyway. 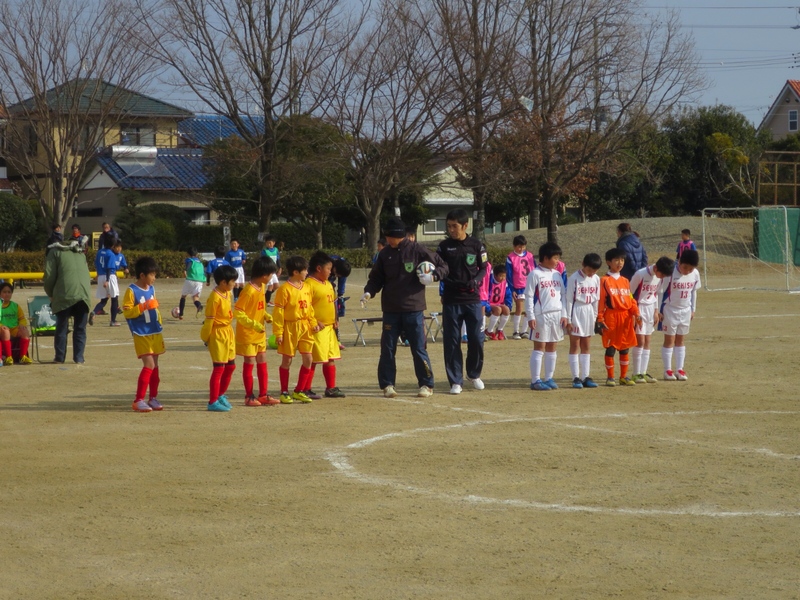 The silver lining to the Kosai defeat was that we faced them again, full squad in regulation field soccer the next day. Little Messi now had to navigate four defenders on his way to the goal instead of one or two; he was neutralized and we took bragging rights back from Kosai on Sunday! (we got our a***** kicked the rest of the day, however). 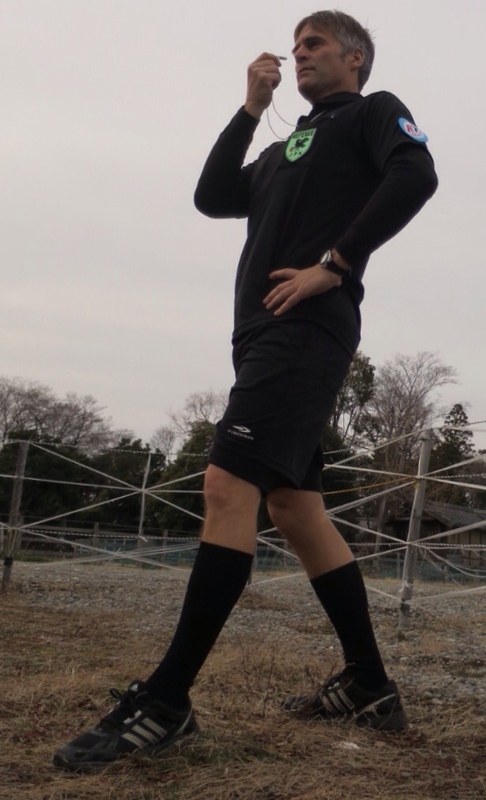 On Sunday I had to ref again, this time in full regalia! All in all, a good soccer weekend!